The regulatory requirement at 29 C.F.R. 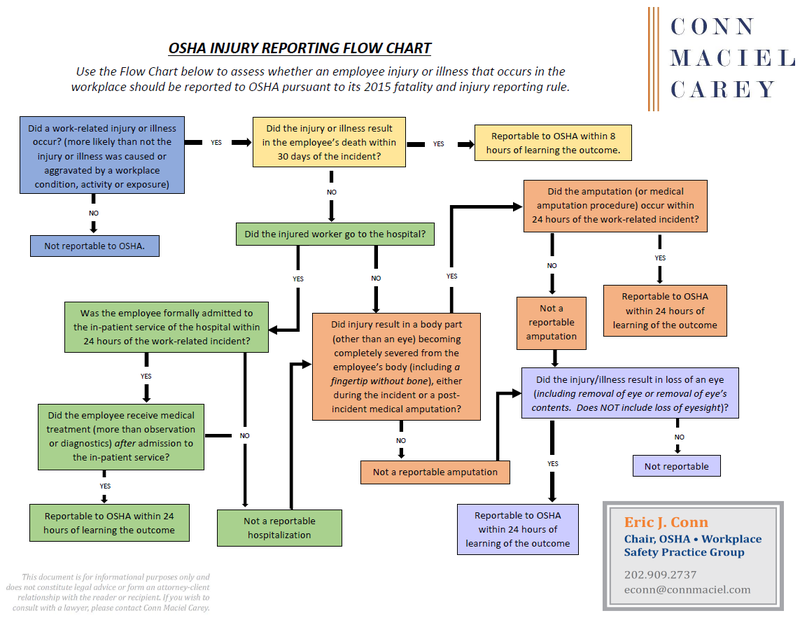 1904.39, OSHA’s Fatality and Serious Injury Reporting Rule, which requires employers to report to OSHA certain in-patient hospitalizations, may seem straightforward, but there are several nuances employers routinely miss that affect the determination whether a hospitalization is actually reportable to OSHA. Although failing to timely report a reportable hospitalization can be cited, and could set up an employer for costly Repeat violations, over-reporting has its own significant consequences. Reporting hospitalizations very often triggers an on-site enforcement inspection, and OSHA issues a citation at least 75% of the time it conducts an inspection (an even higher percentage for incident inspections). Moreover, at least 85% of OSHA citations are characterized as Serious, Repeat or Willful, and OSHA’s civil penalty authority has skyrocketed by 80% in the past two years. Accordingly, it is critical that employers understand the intricacies of what makes an employee’s visit to the hospital a reportable event, and conversely, what does not, so as to avoid unnecessary and costly reports to OSHA. This is a significant change from the prior reporting rule, which required a report to OSHA only if three or more employees were hospitalized overnight. It was extraordinarily rare that a single workplace incident resulted in the overnight hospitalization of three or more workers, and so the instances of reporting under that rule were infrequent. The new rule, however, requires a report to OSHA for the hospitalization of a single employee, which has opened the door to thousands more incidents that must be evaluated for possible reporting. On July 21, 2016, Andrew J. Sommer and Eric J. Conn, of Conn Maciel Carey’s national OSHA Practice, presented a webinar regarding important Cal/OSHA issues that all employers who do business in California must understand. The state of California’s Division of Occupational Safety and Health (DOSH), better known as Cal/OSHA, is perhaps the most aggressive and enforcement heavy approved state OSH program in the country. Cal/OSHA faces many fewer bureaucratic and political obstacles than fed OSHA in developing new rules (really legislation). Accordingly, California employers face a host of requirements that employers around the country do not. Likewise, the Cal/OSHA inspection and appeal process creates several unique landmines for California employers. On February 11th, Eric J. Conn and Lindsay A. Smith of Conn Maciel Carey’s national OSHA Practice Group delivered a complimentary webinar regarding “OSHA’s New Fatality and Injury Reporting Rule – What We Know Now” as part of the Firm’s 2016 OSHA Webinar Series. To kick off 2015, OSHA rolled-out a major change to its Fatality & Injury Reporting Rule to require employers to contact OSHA thousands of times more often to report incidents, which means many more inspections. A year into the new reporting regime now, it seemed like the perfect time to take a look at what is being reported to OSHA and what OSHA is doing with all the new reports. In addition to employers’ longstanding obligation to report to OSHA all work-related fatalities within 8 hours, as of January 1, 2015, all employers were required to also begin reporting to OSHA within 24 hours, all work-related in-patient hospitalizations (of just a single employee), amputations and losses of an eye . OSHA is publishing the details about these reported injuries online. Dissect the nuances of the amputation component of the rule. Under the new reporting rule, employers have three ways to perfect the notification to OSHA. As has been compliant for year, employers may call the nearest OSHA Area Office or call OSHA’s toll-free reporting hotline – 800-321-OSHA. 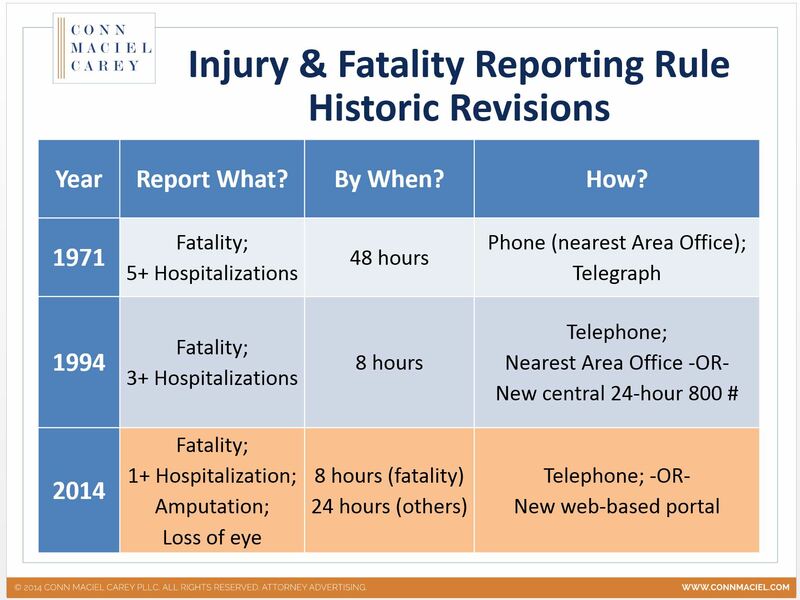 The new rule also introduced a new reporting methodology – a web portal for online fatality and injury reporting. The web portal, however, was under development until just a couple of weeks ago. OSHA was very excited to introduce the new web portal because of the “success” of OSHA’s other recent experiment with web portal reporting – whistleblower retaliation complaints. A couple of years ago, OSHA introduced a convenient web portal for employees to report retaliation complaints, and the number of complaints filed by employees surged. OSHA believes injuries and fatalities are being under-reported by employers, so OSHA supposed that could be addressed by this more convenient technology.